So why am I covering a college football game and what does that have to do with creative arts?????? Well first off let me say if you watched the game or haven’t watched the game. You should watch the game again. 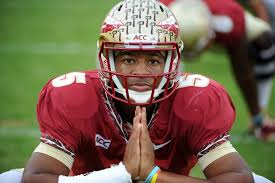 The star of the show..whether you like him or not this night was James Winston….. The games was like a rollercoaster ride or life…..which reminds me of why its important to not pay attention to emotions because they wax and wane naturally depending on experience….but at one point they (florida state) was down by 3 touchdowns..and Winston had just thrown an interception..and threw 3 interceptions (In the same game)……..but he and they didn’t lose focus. They pushed back and fought back and low and behold came out ahead. But had they focused on the circumstances they would have given up…given their situation. So this game reminded me in life..and any endeavor…. you can be down 3 touchdowns…….down 3 sales…..down 3 projects….down 3 million…the only thing that matters is that you keep going and stay focused on the ultimate goal which is your victory in your respective profession or goal. Watch this highlight video to see what happened…. After throwing an interception he knocked the ball away from the intercepter……..it was almost like a magic show..there’s no way statistically they should have won. They didn’t look at the circumstances they just kept believing…….in life people get caught up with emotions and opinions and circumstances…but anything truly is possible….on that note…..go and do what you want to do is the face of the circumstances and public opinion telling you otherwise.